Finish Thompson centrifugal pumps have associated curves. What is a pump curve? It is a graphical representation of a pump's performance characteristics. Let’s take a closer look at what the essential elements mean. Lists the model, RPM (speed), frequency (Hz) and suction/discharge size. SP Series self-priming pumps also show equivalent lift. Use this information to refer to the proper page in the price book to develop a part number. These represent the flow and head generated by specific impeller diameters. Flow is indicated on the bottom axis (X) and head is on the vertical (Y) axis. Using the head and flow information provided by the customer, find the intersection between the flow and the head to determine appropriate impeller diameter. If the customer requires 40 gpm at 50 feet of head select the 3.75” (95.2 mm) diameter impeller. NPSHr is the minimum head required at the suction port of the pump to keep the pump from cavitating. Cavitation is caused when the NPSHa (supplied by the customer) is lower than the NPSHr required by the pump. The NPSHr line is located at the bottom of the curve. Find NPSHr on curve and confirm it is adequate. In this case it is about 10 feet (3 meters). Cavitation tends to be more likely with hot fluids, fluids with high vapor pressures, suction sources that are under reduced pressure (vacuum) or larger impellers operating near full flow. Power shown on curves is for pumping water. Power has to be adjusted for specific gravity (weight of a given liquid compared to the weight of the equivalent volume of water) or viscosity (if greater than 50-80 cP as a general rule). If the specific gravity is greater than 1.0, multiply the power required on water by the specific gravity. We recommend non-overloading power which means the motor size will be adequate to cover the entire range of the curve. This is the lowest possible flow that must be pumped to prevent potential damage. When a centrifugal pump impeller rotates it creates friction which heats the liquid. Above the minimum flow, this heat is moved out of the pump. The efficiency of a pump is the relationship between the input horsepower required to drive the pump and the hydraulic horsepower being created by the pump taking into account losses due to friction and other factors. Efficiency is expressed as a percentage. The highest percentage area is called the Best Efficiency Point or BEP. You can use efficiency to help determine brake horsepower requirements at the duty point. BHP = (GPM x head ft) x SG) / (3960 x pump eff). 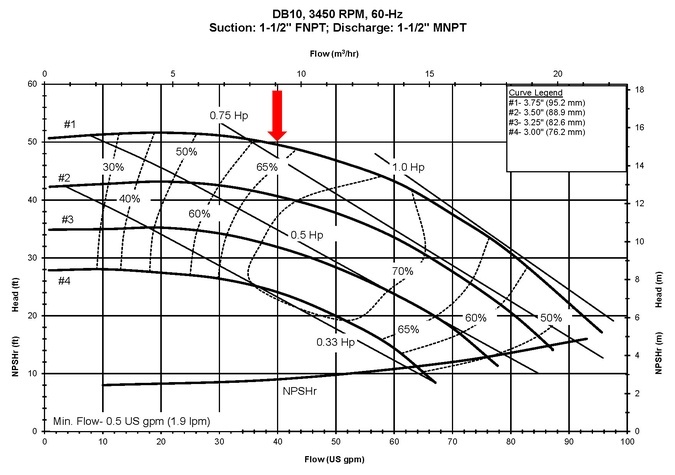 Pump Curves can be found for FTI and All Pump Manucaturers in the Literature / Manuals Tab on the Product Page.